This is from the #170 edition of The Fouling Shot, July-August 2004, by Ed Wosika. It's slightly different than I remembered it, but still good info. I don't agree with everything he says, but I respect a guy who uses lots of hard data to try to understand cast bullets, instead of pulling theories out of his behind. In the course of our adventures in search of excellence in cast bullet performance, if there is one little trick that stands out as being just as important as lube quality and bullet alignment it is the hardness of the bullet, relative to the pressure at which it will be shot. There is no magic number here, just a performance window that works, for reasons that we can name and for other reasons we have yet to discover. I find it handy to look upon this as an envelope of pressure over BHN -- the Kpsi/BHN ratio. The standard hearsay is that this ratio should be between 1.5 and 2.0, in order to collapse the bullet enough -- axially, during its passage down the barrel -- that, despite it's radial expansion, the bullet's collapsing lube grooves will squirt lube out to keep the bullet floating on a lube-layer, thereby providing a good seal and avoiding leading. In other words, a load that will have a 30,000 [30 Kpsi] maximum pressure should have a CB hardness of between 15 and 20 -- for a respective Kpsi/BHN ratio of between 1.5 (20 BHN) and 2.0 (15 BHN). This works rather well for hunting and long-range rock-smashing loads. However, I thought it would be handy to see just how well the winning loads used by the competition wing of our sport measures up to this common approach. After all, if a loading approach works reliably under the pressure of competition, then it works ! Therefore, we should learn from what it has to show us. I had to skip any winning loads that left out crucial values or that use 4759 or 5744 powders because these powders are not listed in Quickload. I stayed with standard chamberings but had to leave out the popular 30BR, given that this is one of the chambers that Quickload does not list. Likewise, I tried to skip repetitions of the same charge, bullet weight, and chambering, given that we want to look at full span of option variations, not how many people copy the same winning load. -- Sometimes, you can get a winning target load with the usual necessary Kpsi/BHN ratio one needs for hunting and long-range plinking loads. For the most part, though, target shooting is an entirely different game that runs at a much lower velocity, in spite of the resulting wind penalty and uses a much lower Kpsi/BHN ratio. 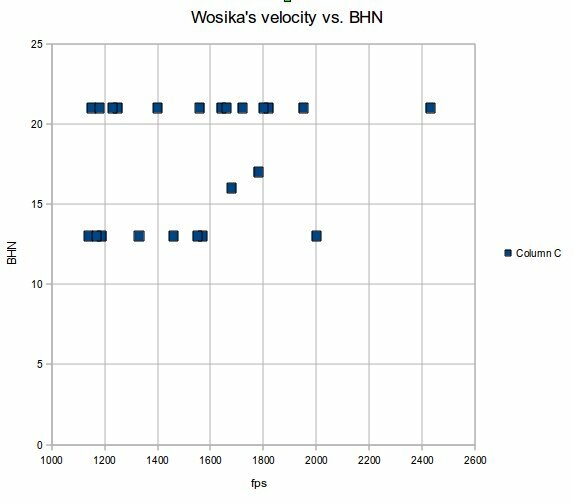 -- Our idea of the proper Kpsi/BHN ratio needs to be split into two groups: 1) the target approach uses velocities in the 1200 - 1600 fps range, with pressures in the 7 - 26 Kpsi rande, and does well with a Kpsi//BHN ratio of 0.4 - 1.9 and 2) the hunting load approach uses velocities in the 1800 - 2200 fps range, with pressures in the 25 - 40 Kpsi range, and does well with a Kpsi/BHN ratio of 1.5 to 2.5. -- 14 of the shooters used linotype (BHN 21). 8 of the shooters used BHN 13, probably either Lyman #2 or a lino/WW blend. Apparently, no one in this study used heat treated WW. This makes sense when you understand that the average is CBA competitor is around 90 years old and heat treated WW was not invented when they got into the game. -- fastest load was 2430 fps, 54,000 psi in a 308 Winchester. That person was using linotype. -- linotype was the most popular alloy, (14 out of 24 loads used linotype). This tells me that these shooters were getting the best accuracy with the hardest alloy they had available. You and I know that heat treated WW can be made harder than linotype, at least when it is fresh, but 90 year olds grew up with linotype, not heat treated WW. -- quickly glancing at all the competition loads posted in this same issue of The Fouling Shot, something like 80% of the loads use linotype. In other words, most competitors are using the hardest alloy they have available, rather than tailoring the BHN to the PSI. As of 2004, very few competitors were using heat treated WW, probably because they were 90 years old. -- there is so much spread on the Kpsi/BHN ratio, from 0.4 to 2.6, that you don't see a trend there. Yes, it averages 1.1, but there is no prevailing trend to 1.1 This suggests to me that there is no pat formula for correlating optimal PSI to BHN. I will try to post a scan of Ed's data table some evening. A scatter plot of the Kpsi/BHN ratio would be useful, too. I made scatter plots to show Ed's data. Doesn't appear to be any correlation between PSI and BHN. Just a lot of people using linotype just because, and a lot of people using medium hard alloy just because. Ditto for velocity and BHN. Thanks for tracking this down; very interesting. Along these lines, there are a bunch of articles (of somewhat varying quality) at the Los Angeles Silhouette Club site (http://www.lasc.us/ArticleIndex.htm) that are worth going through. Of particular interest (to me, anyway) is the one by Geoff Chamberlain on testing the relationship between hardness, ductility, and "toughness". Thanks for the tip on Geoff's article, JWP. Geoff did a very good job of collecting and presenting data. However, I'm not sure why we should be concerned about ductility ? HTWW has only moderate ductility, yet it has proven to be excellent on big game. I noticed that Geoff's bullets have a frosty appearance, as if they were cast hot. I would be interested to see Geoff repeat his test for wheelweight using very frosty bullets vs. shiny bullets. Here's a few WW bullets that I cast today. Sorry for the crappy picture, the lighting was poor. 2 -- slightly frosty, no cracks, but I picked it up while it was hot and easily broke it in two with my gloved fingers. From time to time someone will report a cast bullet breaking in half. My guess is that it was cast too hot and cracked when it fell out of the mold. The crack may have been invisible, but it was there nonetheless. Many antimonial alloys seem prone to hot cracks, not just wheelweight. I believe someone reported a WW & 2% tin bullet breaking in two on a buffalo. Another customer was using a 50% lino blend and having the check shanks break off in flight. At first he assumed the gas check was falling off, but I asked him to search downrange for the check, and he reported back that he was recovering the gas checks still clinging to a broken-off shank. He was advised to cast cooler, and his problem went away.